On a number of occasions, Akinbode Akinbiyi has said he moves quickest on foot. He says this when regarding his life as a photographer working in major African cities. Yet “quickest” contrasts with the rhythm of his work – he spends years, sometimes decades, working on a series of photographs. The idea of a photographer on foot in a city evokes a sense in which time doesn’t merely move linearly, but recurrently. If you move by foot you occasionally pause to wonder, before moving again. Then you might feel obliged to return to where you walked past the last time. Each time he returns to a city where he has previously taken photographs, it is as if he reworks his assumptions about streets, roads, and the strangers who traverse them. These reworked assumptions – glimpses of a metropolis in a swirl of change – can be seen in his photographs of Lagos that go as far back as the 1970s. In some of these photographs it is remarkable how Lagosians are pictured. We see the sheer privacy of their lives, cast against the concrete, steel, and rubble of their city. They are often walking alone. Or where they stand with others, they act or gesture as if alone. An individual life can unfold distinctly within the bustle of a city. 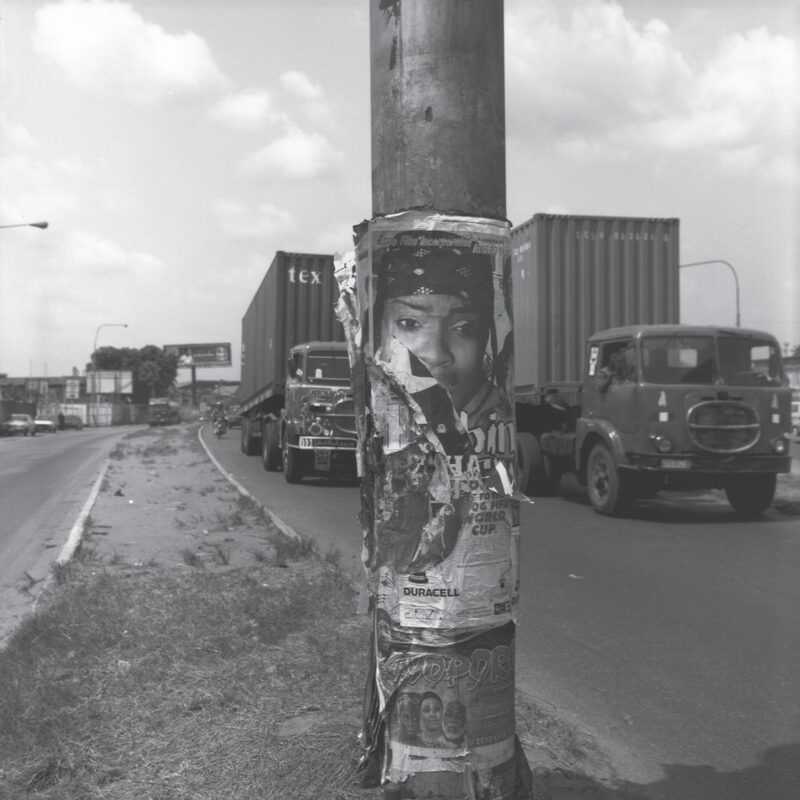 As a photographer who has worked with the same kind of camera since the 1970s, Akinbiyi’s vast, inimitable oeuvre is mostly, at the moment, inaccessible. This is promising. It suggests that what was at first familiar when the photographs were taken, becomes less and less so, until the images tell what has passed into history. In August 2016 I spent several days with Akinbiyi, just as he was about to leave for Berlin to receive the Goethe Medal. I was meeting him for the first time. Yet our conversation seemed to tend towards the conspiratorial. Not quite in the manner of old friends, but as though we were both eager to pass on undisclosed secrets about our lives. As the far younger man, I spoke to him as one would to a grandparent, or a fortune-teller, hoping that the prescient insights with which he responded would subsequently inform the trajectory of my life. He seemed to accept this secret kinship. He responded to me without restraint, focusing on my ideas instead of his, almost to the point of self-abnegation. I hope our conversation, some of which is reproduced below, captures a sense of his generosity. I am not a postcard purveyor of images. I like to demand of myself but also of my viewers. To look at one image I always say you need about a year. Emmanuel Iduma (EI): When I read about how people talk about your work, I find it interesting that you are frequently referred to as a Nigerian photographer. Would you say that’s an accurate assessment, considering that you’ve lived outside the country for most of your life? Akinbode Akinbiyi (AA): I see myself very much as a Nigerian photographer, a photographer who works within West Africa, but also on the African continent. But I understand, even more and more as I get older, the European ways of thinking or doing things, specifically because I grew up in Britain, in Nigeria and Germany, but also in different countries… France, Holland, Belgium. After a while it dissolves to one. I more or less know how to move through all these countries. EI: When we are asked to say who we are or to tell our stories, we often move in a linear direction from point A to point B. I am interested in the definitive moments of your life, which Down the footpath In conversation with photographer Akinbode Akinbiyi are less linear. How would you sum up your experiences, your travels, so far? AA: I like what you said because this linear narrative, I understand it. I appreciate it, but I prefer the narrative to be very much like jazz. For example, I just got back from Lagos. I spent the last two weeks with my parents, who are over 90, but still physically fit. So now, I am their 70-year-old son, I am their first-born, and the three of us were together. It was like going back to 70 years ago when I had just been born. I was born in Oxford. I wasn’t aware then because I was a baby, but we were a close-knit group of three human spirits. Now 70 years later, we are back together again, living in the same house. It’s very interesting because now they are over 90, but their long-term memory is very sharp. They can remember things from those days. They were telling me some very interesting stories. It makes you understand much more about this socalled life in the sense that it is not linear – at least that is the way I see it. I much prefer it to “Once upon a time.” I prefer starting from the beginning, the end, back to the middle, back to two-thirds, and so on. I eventually moved to Germany. Not that it was an important move as such, but it was just that coming to grips with this whole drama of what had happened during the Second World War. I grew up just after the Second World War; I was born in 1946. I can clearly remember my parents talking about the horrors of the war and I had a particular picture of what Germany was like and what the Germans were like. But when you actually live in Germany, you realise that that is just a small part of the whole picture. You are living in a much more complex and very layered experience. And then of course I am very passionate about photography. And also fortunate because I had close friends like Jide Adeniyi- Jones; since the very beginning of my photography, we’ve been collaborating. Even before that, we knew each other. He studied photography; I studied literature. So we always had a close relationship, right up to today. EI: And he was the one who introduced you to photography, if I remember correctly. AA: No. Not as such. He taught me how to develop film, because he was studying photography in London at the time. I went over to London once from Germany, and he taught me the rudiments of the darkroom. All these years, since the early 1970s, we have been talking about photography. EI: So when did you realise you wanted to be a photographer and what was the process? AA: Initially I wanted to become a writer. That’s why I studied English literature at the University of Ibadan, and then all those years I really read as widely as possible. I came back to Britain and did further study in literature, and moved to Germany to try and do a doctorate. And then it was in Germany where I first got a twin-lens reflex camera. That was when I realised I wanted to become a photographer, big time. In 1977 there was the Second World Black and African Festival of Arts and Culture [Festac 77], which took place in Lagos. Jide and I went for it. Then I realised I couldn’t go back. I had to continue with photography. Ever since then, I’ve been a complete photographer. EI: One of the striking things about how you talk about photography, especially in connection with your earlier interest in literature, is that you think of photography as a medium of storytelling. I want you to talk a bit about that, especially in relation to the kind of photographs that you have made. So beginning from the 1970s and up till now, there’s been a strong interest in documentary photography in your work. I don’t know if that is expansive enough to encompass the ideas that you’ve been working with. But for the sake of argument, we can say you are a documentary photographer. How have you returned to photography as a storytelling medium? AA: It has always been there and I see myself as an artist very concerned with what is happening socially, politically, and culturally everywhere in the world. And then especially in big cities, what we now call megacities. I cannot drive, so I really like to walk. And I find walking the best way of navigating urban spaces. I walk in different parts of the city, trying to get an idea of the community or space. From time to time, I try to make photographs. After a year or two years of making photographs, I have a body of work. And what I try to do then is get the sequence going that tells a particular narrative. In Lagos, I’m trying to tell a story almost in a linear kind of way of my growing up there in the 1960s. And then, how the city has moved on. I myself have moved on. Recently again in Lagos, this November, I sensed a new vibe in the city. 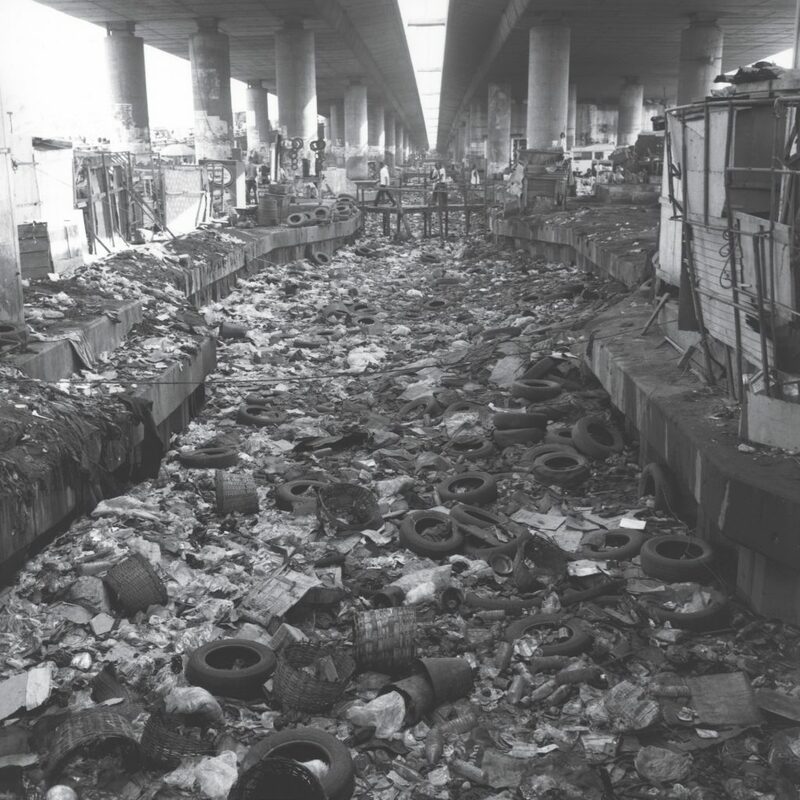 That Lagos, despite the recession, is still constantly trying to redefine itself. I noticed this in Surulere, on Bode Thomas Street, near the shopping mall. In other parts of the city, there is a new kind of vibe. The younger people are coming on board, especially if they have a bit of money to spend, and they are moving around the city. They feel it is their city. It is their space. And they’re not afraid of criminals or armed robbers; they just move around the city. Not late at night though, but in the daytime, in the evening. And I noticed this in many, many parts of the city. AA: I am not sure that was my term in particular, but it is this idea of a specific light, like people talk about a special light in Paris. So, there’s also a very special light in the tropics that Mimi consciously or subconsciously was working with in different bodies of work. She is very aware of the history of photography and is going deeper and deeper [into it]. By the way, the history of photography is so unlimited (laughs), you can never get to its real depth. The more you know, the more you realise that there is much to do, and also you become more sensitive to what has been done before and what is all around you right now. 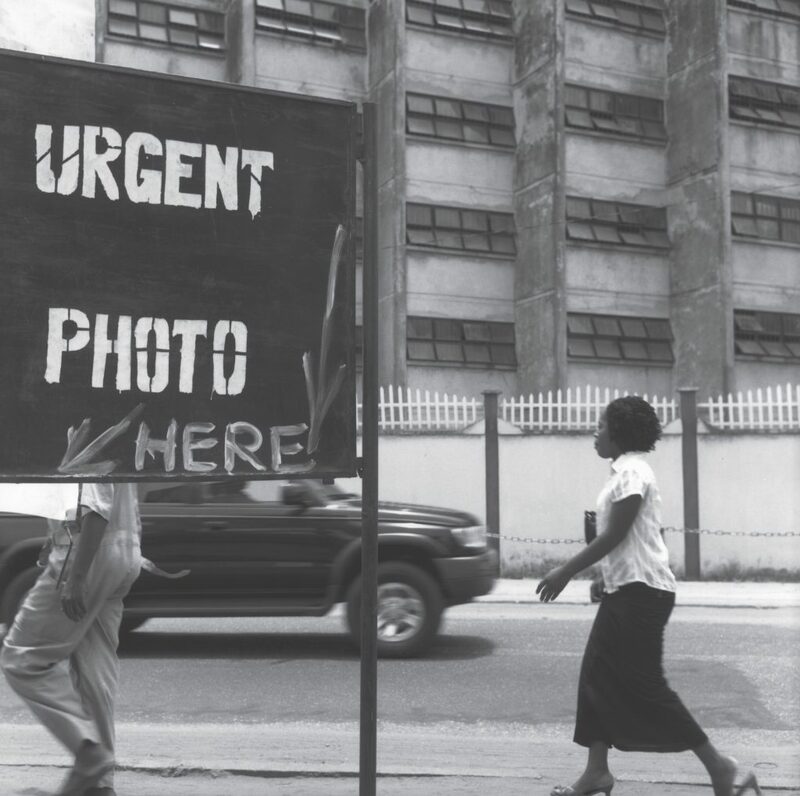 EI: Yeah, but in that conversation you were talking about how African artists or artists in the tropics have made photographs that responded to the kind of photographs that were earlier made with the colonial impulse. And my question, in relation to your work, is if you think of your work within that kind of mode? Do you constantly feel that there is a kind of representation of Nigerian or African people that you are trying to counteract, or is that not necessarily the impulse? AA: I don’t think it is not a valid impulse. Chinua Achebe wrote Things Fall Apart to counteract the narrative that people like Joseph Conrad were putting out. So I think as photographers we have to do this. I don’t think it is really necessary now, but there is a very strong attempt by the Western media and the Western world to depict the tropics, and specifically Africa, in a negative light, as if we are not capable of doing things ourselves. We are more or less like subhuman. This is kind of indirect. The only thing that happens with us is that we are starving. We have terrible warfare always. In fact, just this evening, I saw a big poster about world hunger I am going to photograph tomorrow. It depicts a young black boy seated almost naked on some kind of ground – because I saw it in the evening I am not sure what kind of ground it was – and they wrote under it: “This must stop.” They can’t see us as just black children, people, happy or dressed to go to school or going into the shopping mall. I am not saying that hunger is still not out there, but in the Western world the image in millions of people’s head subconsciously is of an Africa which looks hungry. Directly or indirectly, we have to alter this. I think this is very important. EI: When I look at a number of your images, what I am seeing is not that you are trying to prove a certain point, but there’s a bustle and energy and vivacity, almost like an insistence on life, and especially because these are really big cities and all of these collisions are happening all the time. In photography – and again, I’m trying to be very sincere – the first photographers that made me want to become a serious photographer were Mexican photographers and I saw their work in a Swiss magazine called Camera in the late 1970s. When I saw their work, I said, “Ah, Mexicans can do this? I can do it.” And a few weeks later, I had work in that same magazine, from Nigeria. So I said, “Yes it can be done.” So Mexican photographers were serious guides, though I have never met any of them in person yet. Later on, Japanese photographers. They took a different way of depicting life than the Europeans. But I also recognise and acknowledge European photographers. They are people I respect a lot, like forerunners. Also, American photographers. But then I discovered, through Jide Adeniyi-Jones, black American photographers, and this blew my mind. Because in the late 1960s they started organising themselves in New York, especially through the leadership of Roy DeCarava. DeCarava did some workshops and brought out the Black Photographers Annual, and this annual – Jide showed me first in London in the early 1970s – was just so impressive for us. Coming back to Nigeria, there are very strong photographers like Pa Ojiekere, but also others who photographed in the 1920s and 1930s. And then there are others like Peter Obe. Peter Obe was a photojournalist working in the 1960s, -70s and -80s, and his photographs really struck a very strong chord within me. EI: I know that for years now, you have been travelling to Osogbo to document the Osun-Osogbo festival and I wanted to know how this fits in with your earlier work, of documenting Nigeria’s cities and towns. AA: From the very beginning I realised that to understand our motives, what we do in life, cooking, eating, sleeping, making love, going out shopping, we have to understand the underlying reasons why we do these things. These underlying reasons are spiritual. This spirituality expresses itself in many different forms depending on the location and the people themselves. I realise this in my wandering of cities, because cities have grown up very spiritually. They’ve always had a market place, a place where a king or a ruler lives, and you see the market right in front of the palace and then it also always had a place for execution, for judgment, for festivals and so on. This is what I started trying to understand, read up about, and also photograph, whenever I found examples within Lagos or within Berlin or Paris or wherever. Over the years, I have realised, especially in West Africa and other parts of Africa, these spiritual things or traits are still very strong there. So, you still can find, sometimes even within Lagos, people will do a kind of offering at crossroads or at special corners and on the highway, people will kill a chicken and put it on a white piece of cloth. When photographing these things, I realised I have to get to the source. One of the main sources within Nigeria and especially within Yorubaland is in Osogbo. Osogbo is about the only city left in the whole of Yorubaland that has retained its sacred forest. That’s the forest which is attached to the city or the town 200 years ago and this forest has not been cut down for residential areas or as part of the city. So, it is full of shrines and sculptural objects which have been there for the last, let’s say, 100 years. I have been going there since the 1990s, but more often to photograph the shrines and objects and also the festival itself. I am doing this as part of my work for documenta 14, which is going to take place both in Athens and in Kassel. But I am not just concentrating on Yoruba spirituality. My idea is to present my work on Yoruba spirituality, Greek spirituality, Germanic spirituality. I photograph spirituality wherever I find myself. It is very interesting because you find that, for example, the Greeks have a god for thunder. It is Sango in Yorubaland. So we have the same deity, but different names according to the particular locality of the people. And then you have variations in the way sacrifices are brought to God or the way he is remembered or the way he is now being reinvented in the modern world. So I am trying to delve deep into what underlies most of our ways of thinking, most of the reasons why we are actually now living today. Why do most of us want to live in harmony and peace? Why do we love certain people? Why do we want to have certain festivals or undergo certain rituals like weddings or funerals? These are the things I am going to be looking at, hopefully on a much more subtle level… And the works could be very dense. I’m really demanding a lot from the viewers, and I really hope it will get across. EI: Why that kind of intensity and denseness? AA: Because first of all, I am not the postcard purveyor of images. I like to demand of myself, but also of my viewers. If you give yourself time, you can begin to see the image, but you have to give yourself time and especially with photographs, because so many people nowadays take or make photographs but they don’t look at them properly. To look at one image properly, I always say you need about a year. If a book has a hundred images, that’s a hundred years. So, you really need a long time. I have read Things Fall Apart four or five times and I still haven’t reached its depth. That’s the kind of thing with music or with films or with sculpture… you can look at them for centuries literally. You really have to spend time. This piece appears in the Chronic (April 2017). An edition which aims to complicate the questions raised by food insecurity, to cook and serve them differently. Food is largely presented as scarcity, lack, loss – Africa’s always desperate exceptionalism or exceptional desperation or whatever. 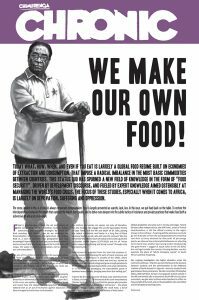 In this issue, we put food back on the table: to restore the interdependence between the mouth that eats and the mouth that speaks, and to delve deeper into the subtle tactics of resistance and private practices that make food both a subversive art and a site of pleasure.